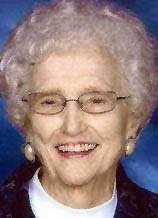 Frances May Boots, age 92, of Tilbury Road in Waterloo and formerly of Waverly died Saturday, September 22, 2012, at NewAldaya Landscapes in Cedar Falls. Frances was born on November 7, 1919, in rural La Porte City, Iowa, the daughter of James and Iva Dell (Goodspeed) Christian. She was raised in rural La Porte City where she attended country school and later graduating from La Porte City High School in 1937. On March 21, 1939, Frances was united in marriage to Floyd Hendrickson they would later divorce. On June 29, 1954, Frances was united in marriage to Vincent Boots. During her life Frances worked at John Deere in Waterloo for several years and then for Rath Meat Packing for 40 years retiring in 1979. Frances was a member of Airstream Good Sam Club, YMCA, and Rath Retirees. Her enjoyments included camping, traveling, wintering in Brownsville, Texas, making homemade gifts, playing cards, and Bingo, however, what Frances enjoyed most was spending time with her beloved husband Boots and her family. Frances' memory is honored by her son, Fred Hendrickson and wife Sandy of Waverly; four grandchildren, Cindy (Hendrickson) and Bo Ellison and Jason and Julie Hendrickson all of Waverly; a great-grandson, Jesse Hendrickson of Waverly; and a great-granddaughter, Jordan Hendrickson of Waverly; a sister-in-law, Rose Christian of La Porte City; and many nieces and nephews. She was preceded in death by: her parents; her husband, Vincent; two sisters; Belva Miller and Leona Kruckenberg; four brothers, Guy, LuVerne, Harry, and Clifford Christian; infant twins at birth; her father and mother-in-law, Ray and Edna Boots; and three sisters-in-law, Marlys Van Horn, Carmen Hemmen, and Marion Boots. Funeral services will be held at 2:00 p.m. on Thursday, September 27, at the NewAldaya Chapel in Cedar Falls, 7511 University Avenue, with Pastor Gary Olson officiating. Burial will follow at the Harlington Cemetery in Waverly. Visitation will be held on Wednesday, September 26, at the NewAldaya Chapel in Cedar Falls where the family will greet friends from 5 to 7:30 p.m.
Memorials may be directed to Frances' family.